I’ll be completely honest: I have no clever opening line for this review. The Martian is just a really good movie. The Martian follows the story of astronaut Mark Watney, who finds himself stranded on Mars after his crew mistakes him for dead and flees from the planet during a deadly storm. Watney must survive his hostile environment and somehow find a way to escape. The Martian is a spectacular adventure that trades out the dread-filled tone of previous space movies for a light-hearted and inspirational story. It’s one Ridley Scott’s best movies in years, and it’s a fantastic showcase for both Matt Damon and his supporting cast. First off: let’s talk about the acting in this movie, because it’s got one of the best cast lineups this year, second only to Black Mass. Matt Damon is downright amazing as a stranded astronaut, as he captures both the optimistic perspective needed to survive such an ordeal and the natural instability that comes with being marooned. But as well as he does in the movie, his supporting cast does just as well. Even though the story separates Damon from the rest of the cast, this is still an ensemble piece. Jessica Chastain and Michael Peña are clear standouts among the rest of the NASA team, and Jeff Daniels and Chiwetel Ejiofor are perfect as NASA executives who are forced to see both the humanitarian and financial sides of the situation. 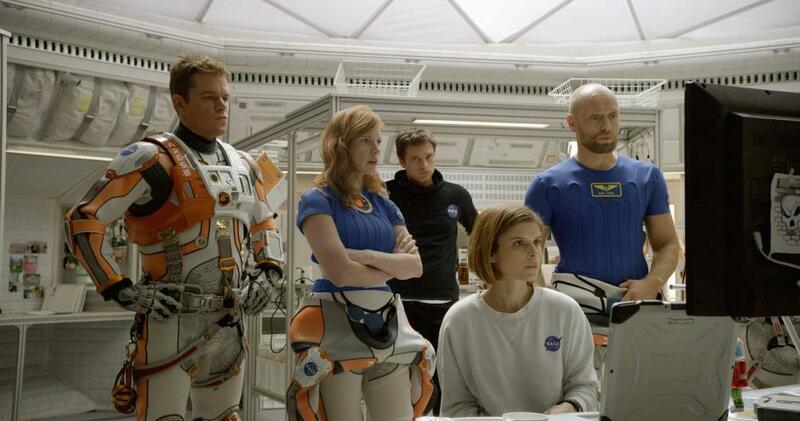 From left to right: Matt Damon as Mark Watney, Jessica Chastain as Melissa Lewis, Sebastian Stan as Chris Beck, Kate Mara as Beth Johanssen and Aksel Hennie as Alex Vogel. If there’s one thing that really sets The Martian apart from recent space-hits like Gravity and Interstellar, it’s the counter-intuitive tone of the film. At this point, when we hear about movies featuring a journey through space, we’ve come to expect heart-pounding drama thrillers that test our human ideas of survival. But while the premise of The Martian falls in line with these themes, what we’re treated to is a relatively humorous and endearing tone that puts a unique spin on everything you see. In addition to the tone, the story is compelling because while a lot of it takes place in space, it’s still a human drama. The characters are interesting to watch, and most of the action comes from great moments of conversation. Something that I was really surprised at was how bright and beautiful Mars looked. The movie portrays a vision of the future, but it’s a future that is very much grounded in reality that one could easily see coming about within the next 20 to 50 years. The colors and the imagery we see on Mars are set up to directly contrast the way everything looks on Earth, and that makes the experience of watching the film so much more captivating. It does well to illustrate the tone, and in a long movie like this, I quickly became thankful I wasn’t just looking at light blues and shades of grey the whole time. I’m looking at you, Interstellar. The movie is propelled mostly by conversation and human drama, so when things become complicated, it slows things down a lot. For the first hour of the movie, the technobabble is manageable, and at times, pretty fascinating to listen to as it illustrates all the possible ways to survive on Mars. After that point, however, keeping up with it becomes a bit of chore, no matter what’s happening on screen. And while the movie’s tone is extremely unique for the type of story it is, it sometimes takes away from the drama. When the plot called for the main character to be in trouble, you almost didn’t feel anything because the rest of the movie was so encouraging and inspirational. You felt like nothing could ever happen to the hero. It’s become kind of a trend in recent years that we at least see one space movie every fall, and I am 100% okay with that. While the premise makes it seem like a “by the numbers” sci-fi flick, The Martian explores new ground that most “lost in space” movies haven’t. If you have any desire to see The Martian: do it. You will certainly not regret it. What did you think of The Martian?